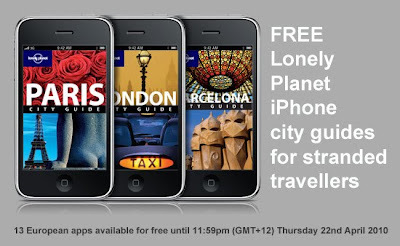 In response to the travel chaos caused by Iceland’s Eyjafjallajokull volcano, which has covered northwest Europe in a massive cloud of ash, Lonely Planet is offering 13 of its European iPhone city guides free to stranded travellers. With a lot of travellers stuck in unfamiliar places, these city guides will provide much-needed, practical information as well as suggestions on what to do whilst stranded. The 13 apps are available for free now until 11.59pm (GMT+12) Thursday 22nd April 2010. Please share this link with any friends or family who have had their plans affected by this. Note: If you download the app for free, it is yours to keep. You will not be charged in the future for an app that you have downloaded free.